I am not sure how much more of this you might need but I have been continuing to work on some English language resources. If they are not interesting or useful for you, just ignore them. I have had some positive feedback, however, so please humour me! Please note, because it is based on a random function, the same word might appear twice or even three times in succession … it does happen! At the time of writing, there are just 62 words in the list. Expand the list as you go along and you will have a very powerful Flash Card, See ‘n’ Say resource. 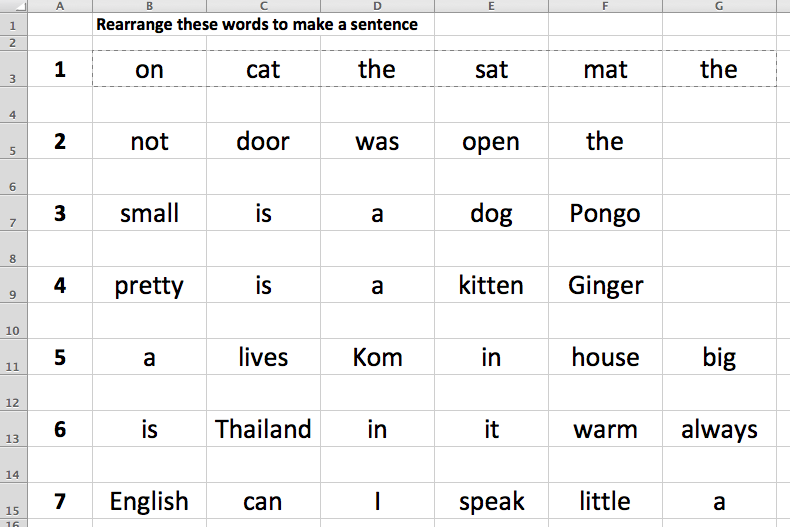 I haven’t automated any of this rearrange the words worksheet yet so what you see has all been done manually. 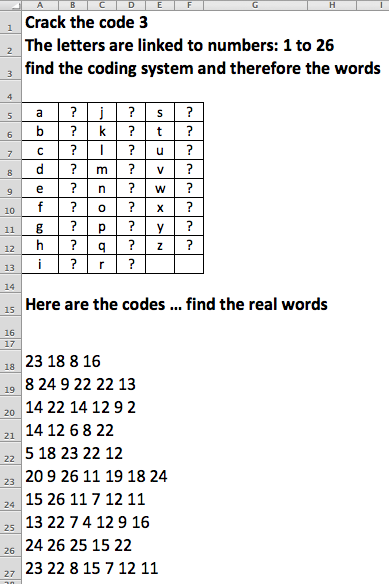 As a boy I loved to crack codes so it should not be a surprise that I created a crack the code worksheet. All I did was to give a number to each letter in the alphabet: A = 1, B = 2 and so on. 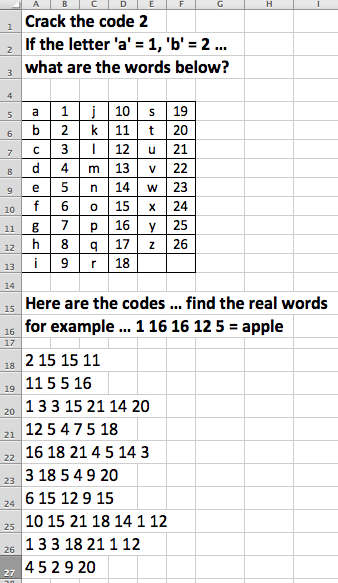 Print that out for each student and they have no idea that all I do now, with any word up to seven letters long is to type a word in a cell and automatically Excel will use the code to generate the worksheet you see there. By the way, it would take only a short time to change this to allow for eight letter words, nine letter words … any number of letters in a word. I chose seven letters as my limit because I am dealing with beginners and not advanced learners. You can even change the coding structure: not A = 1, B = 2 … but, for example, A = 6, B = 7 … or any other change you wish. This is a crack the code and find the word exercise. In this case, I have changed the coding structure. 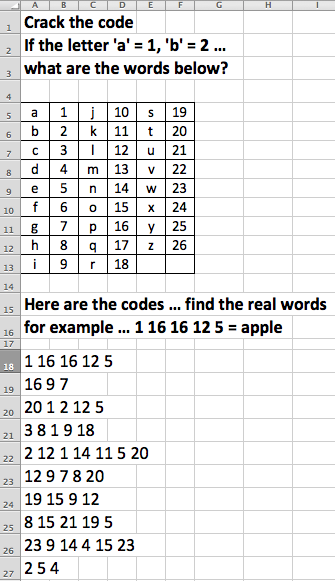 A does not equal 1, B does not equal 2 … In this exercise, you have to find the values for A and B and so on and then find the words. This is not MI5 or CIA levels of coding, so think simple!